Get The Best LED Grow Lights In The Market Today! The LED Grow Lights Judge is your number one provider for the best LED Light reviews and guides. We help indoor growers make the best decision when choosing their own LED grow lights. Choose between an assortment of brands and products that provide superior performance when it comes to growing your indoor plants. We provide expert guides that feature comprehensive product description, the pros and cons, and our own personal take on the product. We are constantly updating our content to match with the hottest and most popular LED grow lights that are currently on sale. We give expert unbiased reviews and recommendations to ensure you get only the best lighting system for your indoor plants. Ever since indoor gardening became a thing, indoor growers have relied heavily on artificial sunlight such as High-pressure Sodium, HID, and fluorescent to mimic the quality and potency of the sun’s rays. These light systems all have their own degrees of effectiveness. However with the turn of the 21st century, a new option became available and is now among the leading light source among the pack: LED. While LED (or light-emitting diode) have been in the industry for decades, it’s mostly used as an instrumental panel light indicator. It was only recently that it has been discovered to be an effective light source for growing indoor plants. Thus, LED grow lights came into play and is now the leading product in the grow light industry. The main advantage of LED grow light over other light sources is the significantly reduced heat and power consumption. LED produces less heat, making it more energy efficient as it can properly provide some much needed light without potentially burning your plants. They also require less ventilation to cool, which means you don’t have to invest in expensive ventilating system to keep it cool. We also review other grow light products. However, our main focus will always be on LED grow lights. The best LED grow lights are space saving, energy saving lighting systems that cater to every household and for various purposes. The simplest way to define a LED grow light is that this lighting system produces an artificial source of light which stimulates plants to go into photosynthesis! It is usually used in places that lack a source of natural lighting, for example for indoor growing. Before the rise of LED grow lights over the last couple of years, growers used other methods like high-pressure sodium lamps and fluorescent bulbs (some actually still like those, however they do need space and produce heat). Space-saving build: The best LED grow lights are efficient space saving mechanisms. While growing plants, you will need a lot of other equipment. But with the advent of LED grow lights, it is possible to go around the grow room as these hardly take up any space. Low Running Temperature: Unlike other sources of light, LED lights tend to run at a lower temperature which can only be described as ‘warm’ instead of a high 400-500 degree Celsius. This ensures that your plants in the grow room are safe and at an optimum temperature, so you need less or no vans at all. Energy saving mechanism: The best LED grow lights are power efficient. This means that they can produce a lot more powerful light with the use of minimal energy. This is an essential factor here. Ease of installation and expansion: Most LED grow lights are very easy to install, and very often are modular and can be installed adjacent to each other. Control: Plants need different light in different phases of their life (vegetative, blooming) and the best LED grow lights let you adjust the wavelength accordingly. Lifespan: This is one of the most important benefits of the best LED lights. These products can work for a period between 50,000 to 100,000 hours of use. So, once installed, you really don’t have to worry about replacing it anytime soon. Here at LEDGrowLightsJudge, we have built an extensive repertoire of knowledge on LED grow lights in order to help you get educated on growing, with lots of tips and tricks, reviews of individual products and of course a list of the best LED grow lights that you can make use of. With that said, let’s go straight to our table with the Top 10 best LED grow lights. Further down, you will then find a summary of the key characteristics for each LED grow light. When it comes to growing indoor plants, the Viparspectra Reflector series is among the best among the rest. This panel has spectrum 3 bands ratio. It gives out enough energy for the plants to utilize it while carrying on with their metabolic processes. What is more is that this LED light can save 90 percent of your energy as compared to the metal halide lighting you might have used before. There is another reason why this LED bulb is perfect for plants to grow. The wavelength of light emitted here is ideal for the process of photosynthesis. For this reason, this light is immediately being absorbed by the plants. This light is also suitable for all phases of plant growth, right from the time when you plant the seeds to when the plants flower and finally when you see the fruit! One of the most popular and best LED grow lights! Apart from the increasing usage to grow weed, these LED lights are used for growing orchids, broccoli, cucumbers, wildflowers, peppers, roses, basil, lettuce, tomatoes, herbs, spinach and many others in this category. This is a good choice for seedling and cloning activities as this can be mounted in tight places without having to worry about the heat building up. This light is appropriate for all stages of plant growth. You do need to worry about changing your lighting after every few days. TaoTronics has really made some notable progress in the field of LED grow lights. Ever since its inception, it has been catering to the plants’ needs for appropriate lighting. This particular LED light comes with much lower power consumption and a long life. It doesn’t generate any excess heat that might prove to be difficult for the plants. The design is made in such a way that the voltage is being stepped down. To add to that, the product is built with the outsides being a heat sink. This means that all the excess heat is absorbed. Even if you keep the lights on for longs hours at a stretch, there won’t be much of heat generation. The wavelength of the light emitted by these LED grow lights is ideal for the plants to carry out photosynthesis. With use, it has been seen that these lights strive towards improving plant health. Comes in a pack of 12 LEDs including 3 blue ones and 9 red ones. It is suitable for all occasions from sunlight, to a rainy environment and even a snowing one. The red LED grow lights are required for the process of photosynthesis while the blue light is mainly helping the chlorophyll and carotenoid. The next entry into our list of the best LED grow lights is this particular product made with the most advanced forms of technology. These lights are known to improve the health of the plants and also result in better yields. Both of these factors come in handy while growing plants in artificial lights. To help the light penetrate deeper in the plants, the product comes with zener protection and 3 watt chips. With years of usage, it has been observed that the vegetation growth increases up to 3 times in the first two weeks of usage. The durable and space saving cabling ensures that you have enough free space in your grow room. Also, the lights keep the temperature constant at around 70 degree Celsius. 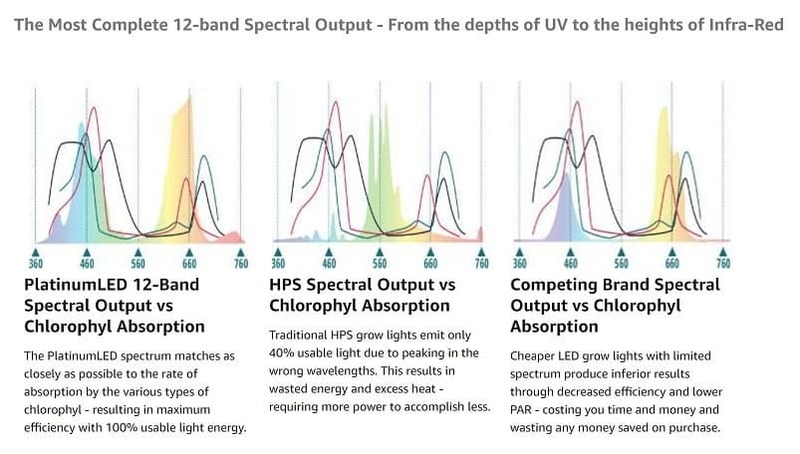 G8LED Technology- This technology provides 8-Band Wavelength Ratio plus real Infrared (IR) and Ultraviolet (UV) light that is ideal for plant growth. 240W Veg and Flower light: This light is enough for the entire growth cycle of the plants and vegetation. It is most concentrated in a region of 6 square feet. These lights can easily last for 50,000 hours or 15 years. There is no question of you having to replace a faulty bulb again. This is yet another LED grow light that wonderfully caters to the requirements of the plants. The light has the ability to penetrate 60 inches past the plant canopy which is actually incredible. This is extremely space-saving and you do not have to worry about placing a big and bulky equipment in your grow room. The brightness of the light will indeed surprise you. But that shouldn’t make you think there will be a lot of heat production. The construction is made in such a way that the excess heat will be absorbed by the light itself and your plants will be perfectly safe. The zener diode protection ensures that the light can avoid an outage of the system. 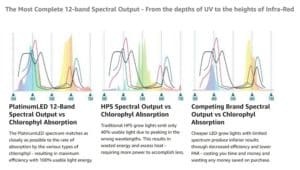 Grow Green with G8LED Technology: This forms an efficient lighting system giving the perfect amount of infrared and ultraviolet wavelengths necessary for plant growth. The 450 W lighting can be best concentrated in an area of 12 square feet. The plants will give maximum yield in this case. The lights use real infrared diodes which give out a bright spectrum for lighting. This particular type of LED grow lights works best with water solution culture and soil culture. This is ideal for different phases during the growth cycle of the plants. Right from planting the seeds to flowering and then the fruits phase, this light caters to each phase separately. Where can you use this light? This is most commonly used in the house gardens, for pot culture, sowing, breeding and the likes. Other than that, it is useful in cases of bonsai, greenhouse cultivation, pipeline cultivation, for flower exhibitions and for so many other purposes. There is a modular assembling system; you do not need to work very hard for getting the device together. This light is also known to reduce the noise by 50 percent which is no mean feat! The MarsHydro LED grow lights give really bright light, most of which is used up by aquatic plants. Improved internal thermal cycle ensures that there are efficient heat dissipation measures in the LED grow lights. It ensures a long lifespan using the latest forms of technology. No maintenance or repair hassles. 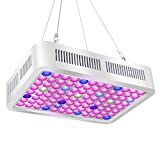 This LED grow light is ideal for all horticulture enthusiasts. Your plants will get the light and energy necessary in the grow rooms throughout their life cycle. It is a 6 band spectrum including 6 different wavelengths. The working temperature is in the range of 0 to 130 degrees Fahrenheit which is pretty nominal. But there will be no excess heat generated. 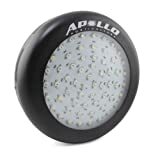 How are these Apollo lights unique? They don’t require any kind of ballasts and are of course very efficient when it comes to heat generation. These LED lights can be placed really close to the plants and yet their health won’t be affected adversely. These grow lights are easy to install and even more comfortable to use. The LED view angle of 120 degrees is pretty impressive also. The LED grow lights can cover an area of about 5 square feet for the vegetated stage and 4 square feet for the flowering phase. The fan is effective in maintaining the optimum temperature of the grow room, but is not very loud that it disturbs others. What is the best part of this series of LED grow bulbs? The fact that, these are Platinum LED bulbs! These are known to provide the highest lumen output per watt! That is some really amazing stat! The product comes with a heat sink that helps the LED lights to dissipate the excess heat generated. This ensures that the plants are not kept in high hear conditions. The cooling fan is also useful, but not very loud. The light emitted by this product will be 100% usable by the plants in the grow room for photosynthesis while only consuming 180 watts of power. The lifetime of 100,000 hours is a really attractive feature in these LED lights. It covers the period of the plant life cycle from seedlings to the harvesting phase! And all this happens with the help of these Platinum LED lights. The 12 band spectrum indeed proves to be a rather useful feature in this. It covers the Ultra violet to the infra red spectrums giving out optimum power. This LED grow light can easily replace any 400 W HPS bulb that you previously used for horticulture. This gives 2x times the intensity of ordinary lights. The next fascinating product in the list of the best LED grow lights is this Galaxy Hydro LED light that has been a revelation in its category. It is a dimmable grow light that comes with a warranty of 2 years along with a lifespan of 50,000 hours! Once you install it, you are secure with your plants in the grow room. To add to that, there is no additional maintenance costs and other hassles. The real infra red radiation given out improves and stimulates cell division in plants. The fan offers a high quality cooling performance. What is more is that the setup comprises of a zener diode protection. This means that if there is one LED light that stops working, the others will not be affected by this. This light saves energy and is thus very environment friendly. The lights come in a 9 band spectrum. This is a great spread for your plants. You can connect a number of lights in a series to get optimum brightness and output! The UV and IR light ensure better sterilization, better harvest and proper cell division processes. It has a 5 year warranty attached to it. Moreover, the customer will also have the 90 days money back guarantee. They boast of having the highest lumen per watt in the grow light division. You will also find brand new aluminum cooling heat sticks and they come with VEG/FLOWER switches. The “Ferrari” under the LED Grow Lights, Kind is definitely not cheap but has recently become quite popular amongst the more ambitious cannabis growers since it has a good reputation of producing high yields. The Kind K5 XL750 is one of the pricier models, offering you an extra large footprint. It can dimm and intensifiy each of the three primary ranges of the photosynthetic spectrum. It is a very powerful model, so keep it at a safe distance from your plants. Different manufacturers give you either one or both of these indicators, and especially if you consider buying cheaper products of less know brands which are not in the Top 10, you should be very diligent in checking the diagrams of PAR values across the whole footprint and at different height. A good manufacturer should be able to give you lots of information about what size of grow area their lights can cover and at what heights, and also the PAR values across the whole footprint. As mentioned previously, to optimize yields the more PAR you can give your plants the better. And in any case, you need to assure that it meets the minimum required for the particular strain you intend to grow. For LED grow lights, wattage is actually less relevant since it only indicates the input (how much power is consumed at the plug) but not the outcome (how bright or intense the light will be, and thus how good your plants will grow). Nevertheless, it is very often used as a proxy to determine how many LED grow lights are needed for a specific coverage. For example, to grow marijuana you will here people tell that you want a minimum of 25 watts per square foot of grow space. 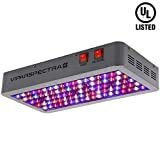 The best LED grow lights people normally buy are all full-spectrum LED grow lights, and only in specific applications does it make sense to go with a specific color spectrum. These applications could include cloning or vegging, or using the lights as and addition. Then, within full-spectrum LED grow lights, you can choose between white LEDs and LEDs using multi-color bands. White LEDs have the reputation to better emulate the sunlight, however do include light in the green and yellow spectrum range which is not usable by plants and thus inefficient. We at LEDGrowLightsJudge do thus think that the best LED grow lights are LEDs with multi-color bands. There are many brands now in the market, some established (if we can say that of a product which has only a few years of shelf life) and a lot of newcomers, mostly from Asia. The ones we list here have either been tested by ourselves or recommended by the community, so we’re pretty confident they work well and have good quality. This is definitely one of the most recommended brands with some of the best LED grow lights. Growers achieve good yields, they come at competitive prices, and have all the bells and whistles modern LED grow lights need today (e.g. heatsink, built-in fans). They offer different models and wattages, we like most the reflector series which goes from the 300w entry-level model for small coverages, 600w for 3×3 and 900w for 4×4. And then there is still the 1200w full-spectrum LED light for the pros. Another manufacturer offering high-quality, cost-competitive LED lights which achieve good yields in growing cannabis and make them to one the best LED grow lights brands. Their entry-level model is the P150, and according to needed coverage you can than choose between the P300, P450, P600, P900 and P1200. They are an US-based company, and give you 5 years of warranty. LED grow lights are the easiest and most convenient option when it comes to effectively growing indoor plants. There are numerous affordable options available online. LED light manufacturers such as KingLED and Viparspectra are notable brands that offer excellent quality LED grow lights. However, choosing the best grow light for your indoor growing endeavors does not rely mainly on the brand you’re purchasing. You also need to consider a number factors before you can land the best LED grow light. Factors such as budget, intensity, and space all play important roles in determining the best LED grow light that you should buy. We should also consider the plethora of LED grow lights that has a number of amazing specs and features. With the number of options available online, picking the right one for you can feel tricky. To help you find the perfect product, we’ve gathered 10 of the best Grow Lights available in the market today. 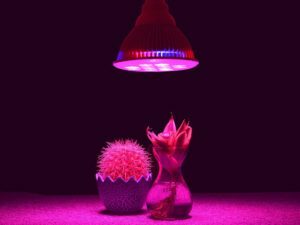 We’re also constantly updating this list according to the latest trends in the grow lights industry to make sure that you’ll only choose the best among the rest. The ideal LED grow light will depend on your budget, how serious you are about your indoor gardening hobby, and how much space do you need to light up. Wattage: measures the amount of energy LED grow lights output at maximum capacity. 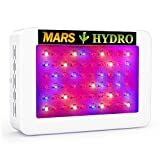 This shows you the potency of these lights, as well as how many you’ll need to effectively grow your plants. Coverage: the total area a particular LED grow light product can reach. When it comes to coverage, requirements may vary, so we’ll provide you with a total measurement by feet to compare. The bigger the coverage, the bigger the kit size. Lifespan: measured in hours, this factor indicates the longevity of a particular LED grow light. Grow lights with longer lifespans are important since you don’t want them to degrade after just a few months of usage. Power Draw: measures the average wattage consumed during use rather than the power output. This is important to know so that you can estimate your energy costs. The best LED grow lights are a revelation if you are a horticulture enthusiast. With minimum power consumption, maximum power output, lower heat generation and others, these lights really do wonders to your plants’ health. We hope that with this review, you have been able to narrow down your choice on the best LED grow lights for you!